This time I am for real, this past weekend was the last day on the ice for me this season. March 23rd, the second latest I have ever ice fished, last year I was able to ice fish into April. Clear Lake was our choice on this day, knowing the ice was good and a chance to catch some yellows was all I needed to pack the gear in the truck and head north one last time. It is always a long ride home, thinking back over the year and already looking forward to next year. It was a good day on Clear Lake, and the yellows did not disappoint. There were four of us in the group on Saturday which always makes things easier when trying to track down the yellows. We made quick moves at first after a few smaller perch and a couple nice crappies. Once we found an area that the yellows were cruising through we made smaller moves to try and stay on the hungry fish. The day was beautiful, temps were in the high forties with a light breeze and plenty of fish to keep us busy between telling stories. On this particular day at Clear Lake the yellows seemed to be very close to and in the weeds. We found a nice big patch of eel grass that the fish were relating to, no doubt chasing bugs and worms, and caught most of our fish there. Time of day did not seem to matter as they bit pretty consistently through the noon hour and into the early afternoon. Hoping from hole to hole with my bucket system and Vexilar FLX-28 helps me to stay on the move and see if active fish are below me or not. If not, it is a quick move to the next hole. Something that I am getting more and more comfortable with is the 36-inch Jason Mitchell Meat Stick paired with the Quantum Throttle. The length of the rod and smoothness of the reel make for easy work hopping around and dropping down to jig for another yellow. Spoons seemed to be the best option on this day, several colors were working well, silver, gold, green, and my white/yellow Reins Tungsten Spoon. I am really looking forward to using these more this summer and next winter. A great spoon with a quick fall and flutter action. That is a wrap on the ice season...I really do mean it this time. It is once again time to transition to the boats for my next fishing adventures. It was a great ice season, and I am looking forward to the next one. best on this day. After about 30 keepers we were off to the next lake in search of some big bluegills. This lake had the potential, but nothing panned out. We hit many different structures, deep and shallow water, nothing...and nothing. We struck out and didn't want to spend anymore time on this last day of ice fishing searching. We had decided to head for lake #3 on the day in search of some Yellow Bass and a to try a new jigging spoon. I was looking forward to the third lake as I had a new jigging spoon I wanted to try out. Reins fishing came out with a tungsten jigging spoon this year in multiple sizes, large enough for open water bass and small enough for panfish too. I had a feeling they were going to be great for the fast-action yellow bass. Yellow Bass are always fun to chase, and when I say chase that is exactly what it is. You have to drill, and drill, and drill to chase them down. We did find a pattern pretty quickly as looked at the piles of fish on the ice. All the fish were in a straight line, all in 11-12 feet of water. They were cruising this contour up and down the lake. The Palputin Spoon from Reins was the ticket. They performed to my expectations and then some. The quality of hook that comes standard with these spoons is like nothing I have ever seen before in the world of ice fishing. When you set the hook on a fish, there was no coming off. 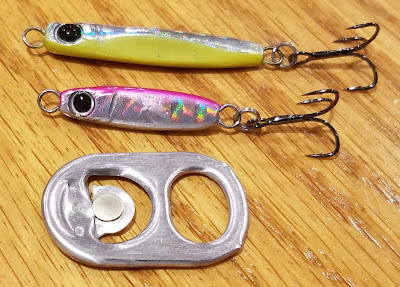 These are the real deal, and when you see a mark on the on the Vexilar while hole hopping these spoons get down to the fish fast! 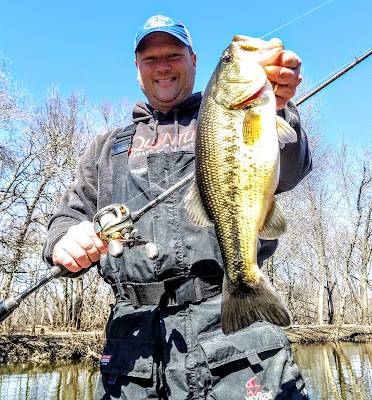 It went perfect with my favorite rod/reel of the year, the Quantum Throttle and a 36-inch Jason Mitchell Meat Stick has been a go-to combo all year long for hole hopping. It was perfect on this day too. Will this be the last day on the ice, probably? The next weekend is pretty busy and traveling several hours north to get on safe ice just isn't in the cards. It was a great day on the ice, and a perfect way to remember the year on the ice! Please practice catch and release when you can. A dozen to take home. Each fall begins preparation for the upcoming ice fishing season. What takes place in these months often shapes how the winter will go. The winter has been a busy one personally and on the ice too. Last fall a particular lake was on the "Hit List" for this ice season. Lake MacBride was this lake and this past weekend it was time to check things out. The lake is known for ice that doesn't grow as rapid as nearby lakes, but there is no shortage of ice this winter in Iowa. It was the perfect time to hook up the snowmachines and get to business trying to see what the buzz was all about. 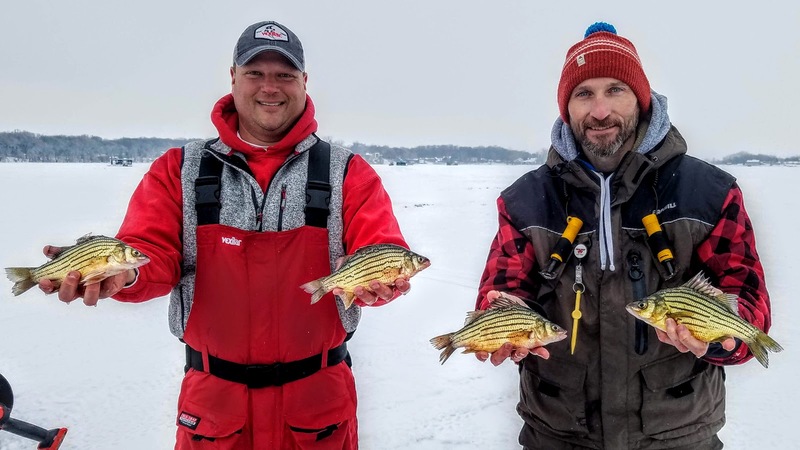 The lake has had good reports for crappies and keeper walleye all fall and into the winter. Crappies are a main target of mine in the winter so of course that was the reason this lake was on my hit list. 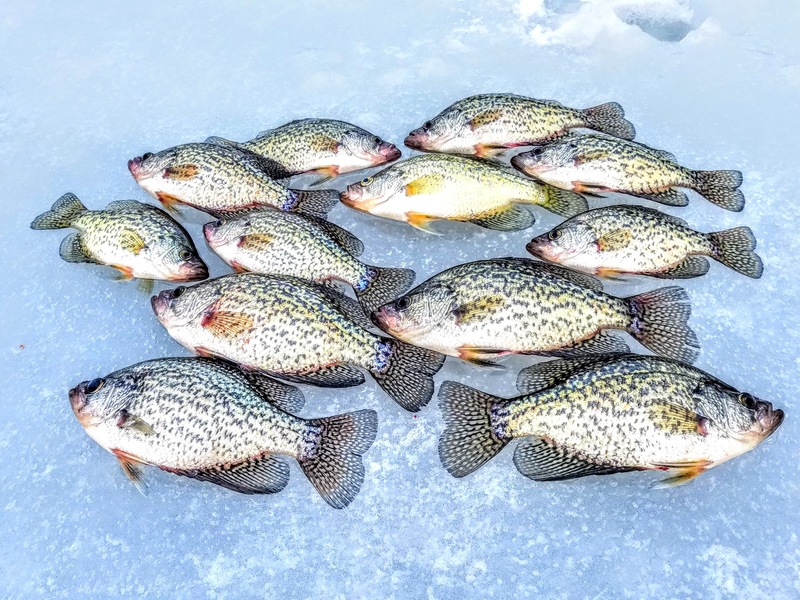 David Gissel has a knack for finding crappies too, so it didn't take much arm twisting for us to mark it on the calendar. To our surprise as we pulled up the lake was very busy, numerous groups and pairs spread all across the southern arm of the lake. As we entered the lake and took a look at the GPS units we could see that most anglers were targeting the rock piles spread throughout this area. We decided to start looking at the deeper banks and points in search of roaming crappies. We looked, and looked, and looked but after dozens and dozens of holes the Vexilars were blank. Next on the list was to try some brush piles. This didn't take long with the GPS units. Soon we were drilling out every brushpile we could find and soon catching fish, mostly crappies. A quick tip for those using the Pro-Ducer on the Vexilar models, it was very easy to see the brushpiles by turning up the gain or the cone angle and stirring the hole with the transducer. This showed us which way to drill next and in the end found us the piles much quicker. Once on top of or near the brushpiles we would turn the gain down to decrease the cone angle back to 9 degrees, giving the us the most direct look into the brush below. By getting the most out of our electronics we made the most out of catching crappies all day long. A variety of baits were working throughout the day, jigs with plastics or spikes seemed to be the most consistent along with a small jigging spoon. We would tip the spoons with numerous spikes to use the baits' scent to its fullest potential. The water in areas of the lake was dirty, so I think the spoon really helped the fish to see the bait from a distance. I used the 36-inch Jason Mitchell Meat Stick for almost the entire day. I have paired this rod with a Quantum Throttle size 10 reel. This combo is ideal for hole-hopping as it drops the bait very quickly and has the long rod for easy jigging without using the reel. The reel is so smooth in the cold weather and the drag is second-to-none. 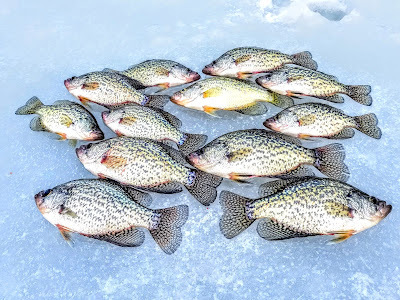 We ended up with dozens of crappies on the day, and David took a dozen home for a meal. 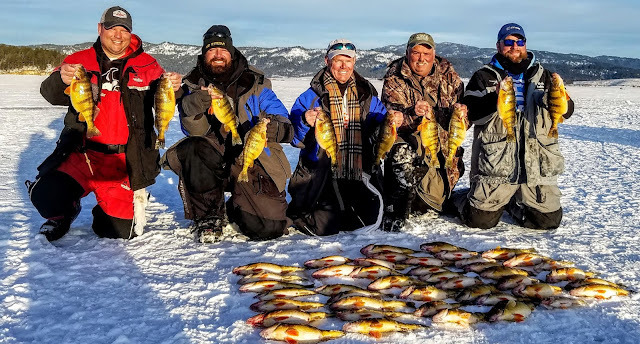 Most of the crappies were in the 7-9 inch range that we came across that day, however there were a few 11-inch fish mixed in as well. Several bluegills on the day, but all were quite small. The bonus fish of the day had to be the numerous Spotted Bass we caught. 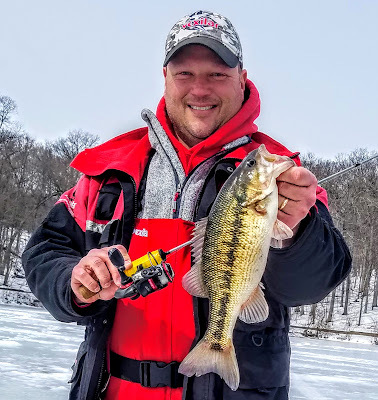 Neither one of us had ever caught one through the ice before (Lake MacBride is the only lake that has them in Iowa) and they put up quite a fight for us. We caught several around the 14-inch mark for the day. 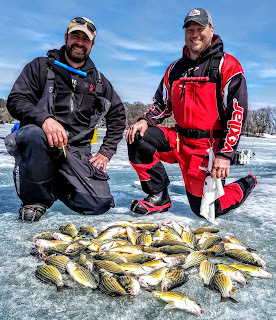 Looking back on our first trip to MacBride on the ice we did many things right to find fish. However, we spent a lot of time in the deeper, main lake water that didn't produce a bite. Perhaps it was just that particular day, or maybe that lake sets up that way, the crappies just don't use that structure in the winter. Each fishing trip is test, and a chance to learn for the future. We sure had fun learning on this day! 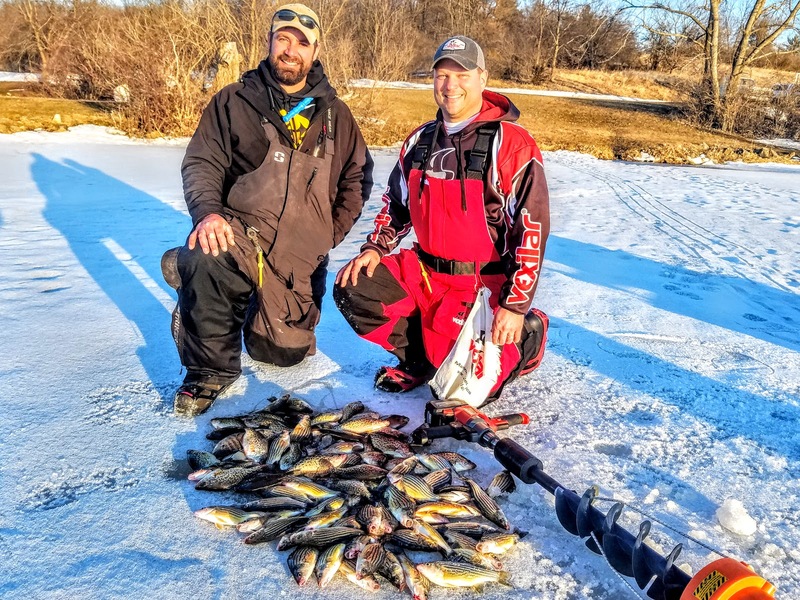 February 10th marked the day for the 2019 YBB, Iowa's largest ice fishing event. The event has occurred on Clear Lake for several years and Jacy Large and I have teamed up to the fish in the past 4 years together. We always have had the goal to have fun and try to get to the top 25, but with tournament fields ranging from 220 teams to the nearly 310 this year it is never easy. In the previous four years we accomplished the "Top 25" goal three times. In 2015- 5th place, 2016- 15th place, 2017- 16th place, 2018- 150th place. That placing didn't settle well with us, even though we were lucky and still won an ice shack. I don't like luck, and was really pushing to get to the top 25 once again. This year, the tournament goal was to weigh in 30 yellow bass. We were able to get into town Friday night to prepare tackle and gear, ready to hit the ice for a practice day on Saturday. We started in the little lake and moved very quickly from spot to spot. I was amazed to see the ice so thick, I had no way of measuring it, but I would estimate at least 18 inches. Typically with that much ice I like to use the propane powered Eskimo auger...reports did not say the ice was going to be that thick. That was a mistake...but in the end it didn't matter. Lesson learned, you have the space, bring ALL your equipment! Oh well, we drilled out the little lake and several species were willing to bite; walleyes, perch, white bass, crappies and a few yellow bass. 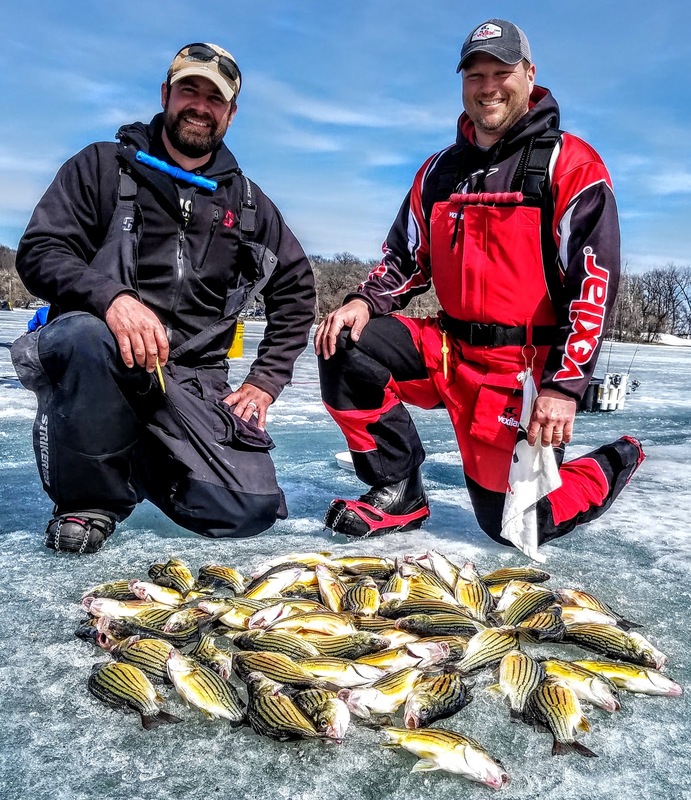 We never were able to catch more than one yellow bass in an area, although the yellows were of very good size on the little lake, we decided to cross it off our list. 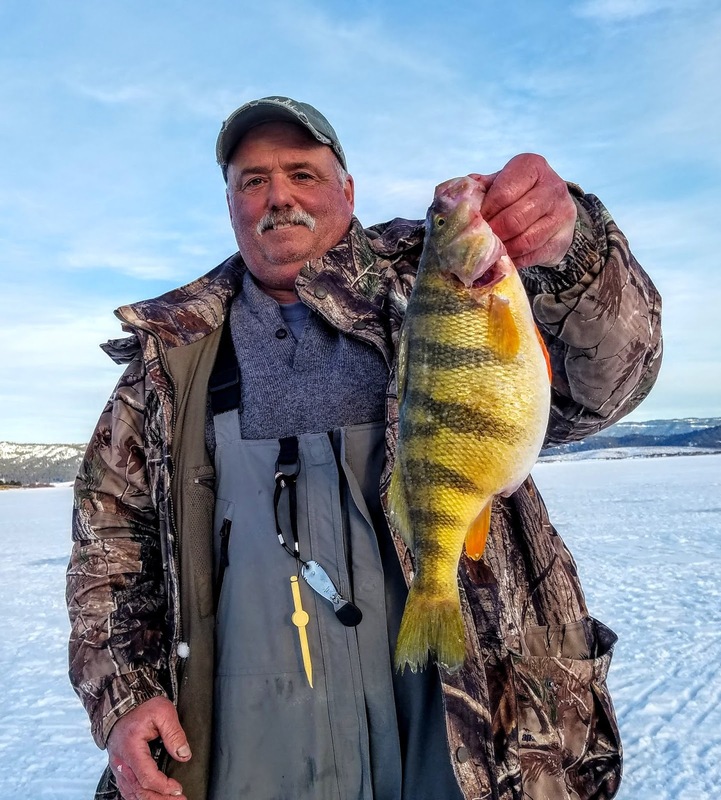 Numbers is the name of the game with yellows, and if you are seeing multiple species and not groups of yellows, then it is definitely time to move on at Clear Lake. We moved over to the big lake and like the previous weekend many anglers were grouped up around the pumphouse and baptist areas. The secret was out...if it was ever a secret. The yellows were on that side of the lake and it was up to the over 600 anglers in the tournament to trick them into biting. Once we joined in and around the groups our Vexilar FLX-28s were lit up pretty regularly. 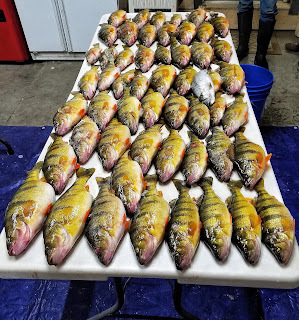 The yellows were there and ready to bite, numerous yellows in areas and we knew we would have to work pretty hard on Sunday to get our 30 fish in the bucket. It was time to head back to the house and regroup for tournament day. We re-tooled some baits and were set for the event, it was off to the YBB Banquet. The Surf Ballroom in Clear Lake has been the venue for the banquet each year. It is a really neat place with a ton of history. The stage is always full of prizes and this year well over 600 ice anglers were there to have a good time and enjoy a meal together. 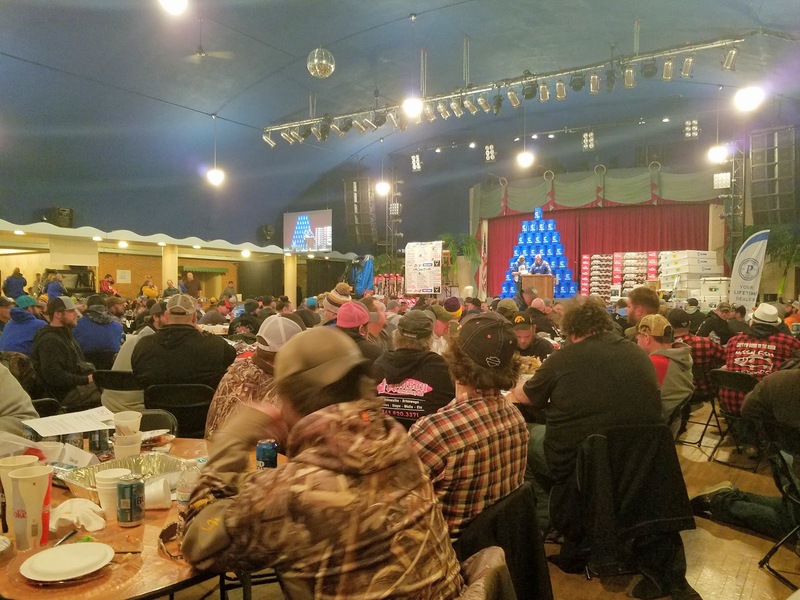 The meal was fantastic as usual and the opportunity to see and meet new ice anglers from around the state and Midwest is a great time. Kevan Paul and Chris Scholl along with their staff at Clear Lake Bait and Tackle sure have things figured out. Everything is smooth from check-in at the banquet to the final weigh-in on Sunday. 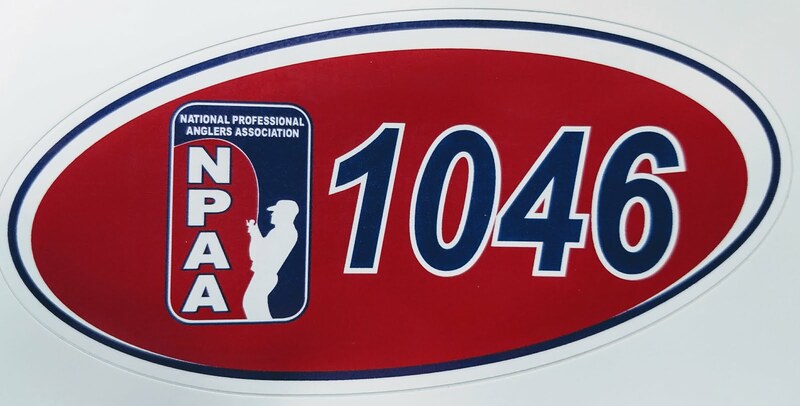 Hats off to them and their staff for putting on a great event for ice anglers. This year the prizes totaled over $40,000 which included a 4-wheeler and a Polaris Ranger! The event typically fills up by the end of November, so if you want a spot next year, I would say get signed up and get signed up EARLY! 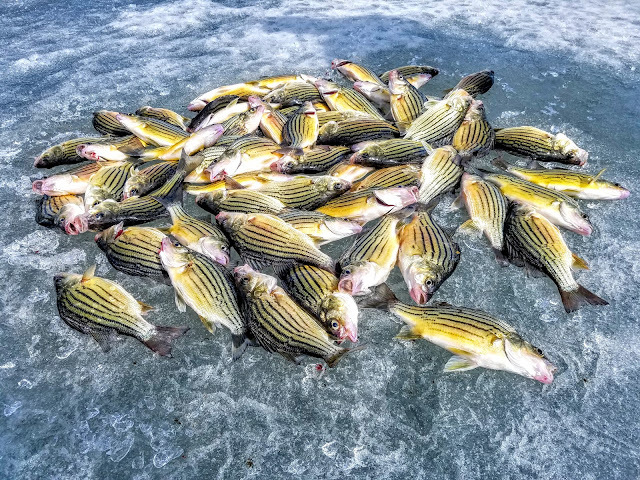 The goal each year is a top 25, this year we knew the fishing was a bit "off" but we knew we had to get our bucket of 30 yellow bass to try and get towards the top. With over 300 teams in the competition each team choose to either start in the big lake or the little lake. This really helped keep the shotgun start safe for anglers and worked great. We began in the big lake near the channel and caught 4 or 5 yellows, all of very good size, but we were not seeing many of them on the Vexilars. It was time to move. We moved away from this area to some shallower water to an area we caught a quick few on Saturday. We set up a few holes in 5 feet of water and little perch moved in. After seeing several smaller marks on the Vexilar screen follow our jigs and spoons and then catching 3 small perch, we were out of there in just a few minutes. We went north towards the pumphouse area and sat in the middle of two larger groups in about eight feet of water. Staying away from the crowds on this move helped us the rest of the day as we never had to move the snowmachine again. We started picking up a few yellows right away and they slowly became more frequet as the morning went on. 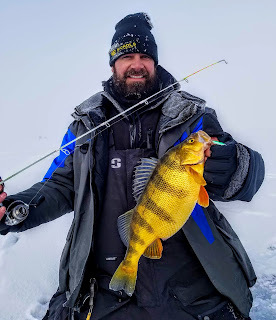 Although we didn't catch a good ratio of fish that came on the Vexilar we knew we were in the right area as we were getting enough bites and the right size of yellows in the bucket too. It wasn't easy, as many fish would look and toy with us and simply would not bite, but we stayed with it as I was pretty sure the yellows were swimming right at us. The Vexilars were becoming more regular as the morning went on, showing fish moving into the area we were at. It was a perfect scenario. Jacy and I both had a couple of good runs late in the morning. We both were able to pop multiple yellows out of the same hole and stared getting towards the tournament limit of 30 yellows. Battleing these larger than normal yellows sure is a treat using high quality rods and reels. I love the Jason Mitchell Meat Sticks coupled by the Quantum Throttle Reel. The reel is so smooth with 11 bearings and the drag is no match for the scrappy yellow bass. We kept gathering our yellows here and there, at times they wanted a small jig, which is the specialty of Jacy, while other times they wanted a spoon, which is my specialty when it comes to Yellow Bass. The time went on and 12:30 was upon us. I decided to go count the fish and make sure they were fresh in the bucket. I knew we would be pretty close to 30, but as soon I dumped the bucket on the ice, I knew we didn't' have it, in fact I thought we weren't even close...I was crushed. I quickly started counting; 10, 15, 20...oh boy. Yep, 29, actually it was more than I though we had when I dumped the bucket out. I yelled over to Jacy, "We need one more!" Nothing, he didn't say anything...just sat there. I yelled, "Did you hear me?" He then says, "Yes I heard you, I'm trying". In the next twenty minutes we both ended up catching a couple more, so we had our bucket of 30 yellows and were able to replace some smaller ones, which is always a good feeling in a tournament. Off we went to the weigh-in to see where we would fall this year. Jacy got in the weigh-in line, I tended to the mess of ice equipment we had used for the day. When he came back I could tell by the grin on his face we did well. He said, 17.04 pounds. I knew this was a good weight and I was pretty sure it would land us in the top 25. We were thrilled as teams were called off to collect their prizes, 25th place, 20th place, 15th place, 10th place..."We made it in the top 10 again" I said to him, as Jacy was grinning ear to ear. When it was all said and done, we ended up in 7th place out of about 310 teams. A plaque for the wall and a new pair of Costa Sunglasses for each of us too. A great way to end the weekend, it is always fun to fish with Jacy and this event makes sure it happens every year with a little pride on the line too. I also learned a unique trait of my friend this weekend that I never knew before; when under extreme pressure he seems to freeze and focus immensely on trying to solve the problem. I learned this on the ride home when I asked him if he heard me say we needed one more fish...he simply replied, "I heard you the first time...I was just nervous I would catch the next fish to make 30!" Always nice talking with you Jacy! This year was the year for another long trip out of Iowa to chase some fish through the ice. Lake Cascade in Idaho is a lake I have read about and have seen hours of video on. 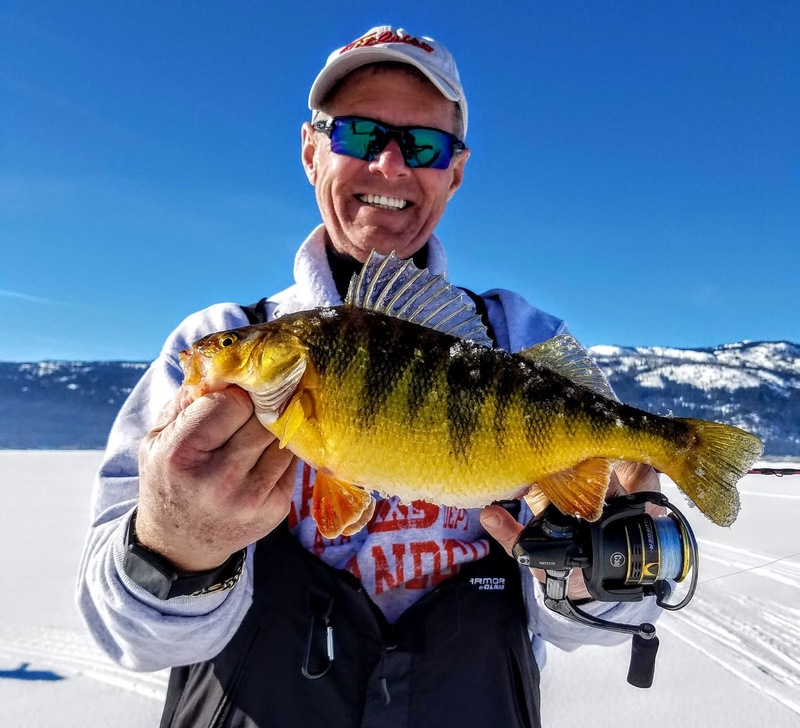 This lake is known for its World Class Yellow Perch. The ecosystem of the lake has grown HUGE perch for the past couple of years and is peeking, or perhaps on the downhill slide. Time was running out to make this bucket-list trip. This is not a trip you take alone, or even with one other person, the lake is huge in regards to Iowa lakes and there is the length of travel to consider as well. It all started when I heard someone say "Lake Cascade" at a Buchanan County Wildlife meeting. My ears perked right up, and I joined the conversation. 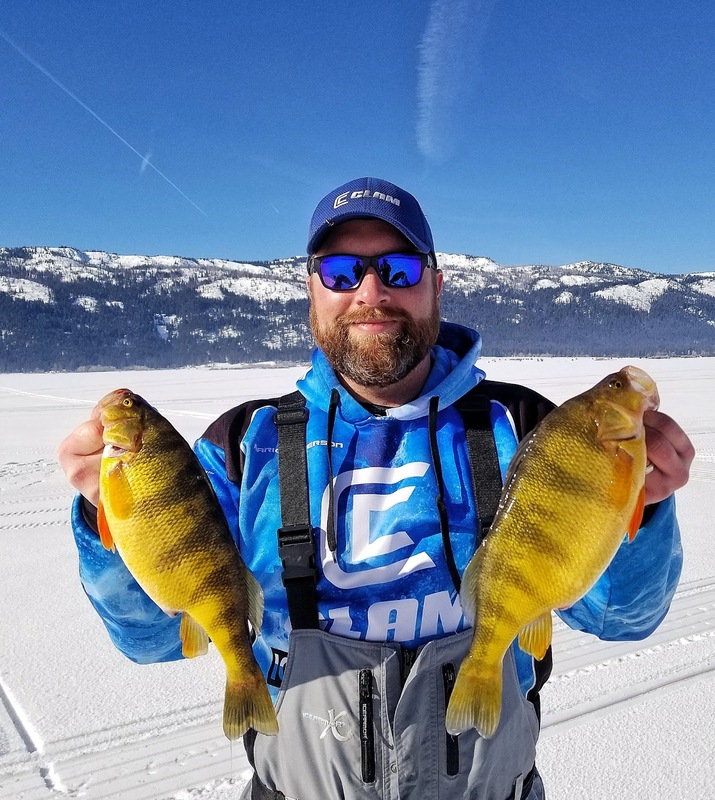 At first I was a little blown away, could anyone be as crazy as I am about ice fishing? I guess so. Mike Lenius and Jim Klever were discussing it, Mike was all in and wanted to go, while Jim was not on board...I had to speak up. I was interested in the worse way. Our enthusiasm grew quickly and soon we were organizing lodging and an outfitter for augers and snowmachines. The snowball was growing and rolling downhill at increased speed! It was going to happen! David Gissel jumped on the Cascade train, as well as Mark Anderson from the Des Moines area. We were 5 guys from Iowa that were going to cross off a bucket-list destination. We boarded a plane out of Cedar Rapids on Thursday morning, January 24th and headed to Boise, Idaho. The lake is about 1.5 hours north of the airport and so was the lodge we stayed at. 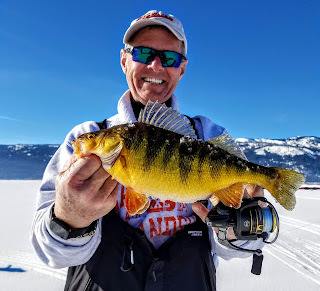 It put us minutes away from the best perch lake on the planet. We were all so excited for the first morning of fishing...it was hard to sleep! Day 1: We met the outfitter at 8am and took off for the lake after getting the gear packed. Most of us brought our Vexilars , rods, reels and tackle either via a check bag or FedEx shipping, the outfitter had the augers and snowmachines for us to use as needed. The fog was thick as we stopped at the first area. Other anglers were around and we joined right in. A few fish showed up on the screens but no takers. Off we went south to another area, a little bit deeper. This area was deeper and along the main channel of the lake where is drops into 40 feet of water. We focused on water in the 21-26 foot range and immediately started to bring up some fish. The first one I brought up was a dandy, a male about 12 inches long. I was elated until the outfitter came over and said, "oh, that is a small one" and then he walked away. I thought, what the heck??? Anyway, he was right, that was small for this lake after I caught a few more. The perch in this lake just grow differently. Thick, long and with a lot of girth is the only way to explain them. The weather each day was almost identical; teens in the morning and then sunny and 30's in the afternoon. The wind was around 5mph all three days, Mother Nature was looking out for us on this trip, she couldn't have been any nicer! This certainly had an affect on us catching so many perch. We ended the day with 41 keepers. Our best day on the lake; 53 keepers. Day 2: We started a bit earlier on this day knowing the lake would be much busier. We were able to go back to the same area and continue to work over the 21-26 feet of water. The big highlight of the day was Jim and his 2 pound 3 ounce perch, it was HUGE! It was the biggest of the trip for any angler, by quite a margin. Day 2 was our best day as a group, we ended up 53 keeper perch that day. We were able to clean all our fish at the Birch Glen Lodge where we stayed. This is a perfect place for anyone in the area looking for a place to stay while ice fishing. As a group on this second day we definitely were able to do some fine tuning on the baits we were throwing. The perch were not active and rarely, I mean rarely did you get a "thump" for a bite, it was more of a hesitation in your line. Something that me detect the bites was a Jason Mitchell Meat Stick. 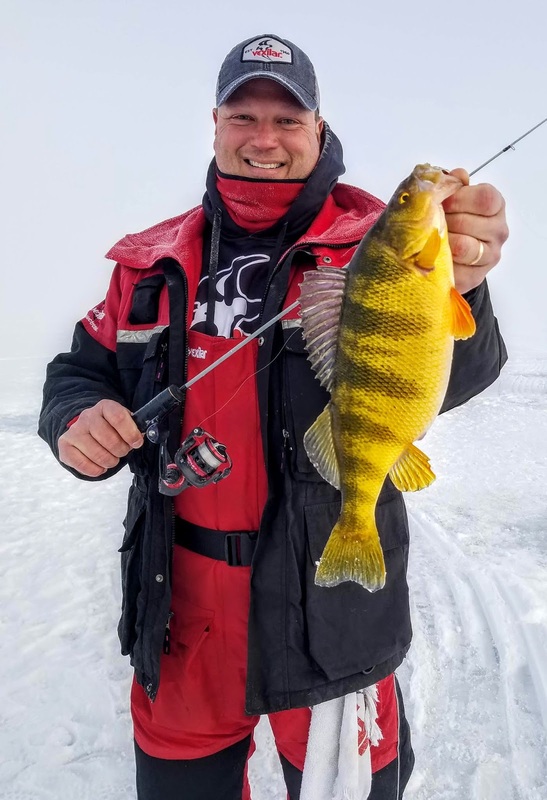 These have plenty of power to fight the biggest perch, but soft tip for working a spoon and detecting those subtle bites. By the middle of the second day everyone was using a spoon of some sort, and some added a dropper chain to it too. Both the regular spoon and the dropper chain did well on this trip putting almost all the fish on the ice for us. Although many of the perch we caught were regurgitating small blood worms they seemed to like the spoons tipped with a small piece of Tiger Worm (small nightcrawler). Teamwork was necessary for everyone to get some fish, sharing knowledge, drilling holes, and moving together to find the next bite was critical in catching so many fish. Day 3: It was a sad day...IT WAS THE LAST DAY! Again, the weather was perfect for hole hopping and chasing down these wandering perch. We all knew what we had to do, use teamwork, spread out and find the roaming fish. 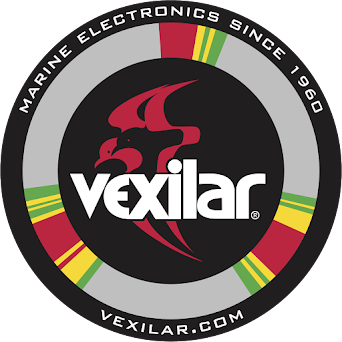 Catching a single fish that came in on the Vexilar was no easy task, many times they would play around with you, but end up leaving. However, when two or three fish showed up together you were almost certain one of them was going to bite. Often times picking them off the bottom with the Vexilar in zoom mode made this an easy task. If you were not in the zoom mode, you simply would not see the perch on the bottom. Switching to zoom mode on this trip was critical to catching a few more fish as they tried to swim by on the bottom undetected. Sorry Perch, you may be the biggest in the world, but you were no match for the Vexilar FLX-28 zoom! We ended this day with 38 keepers, and so many memories for all of us to enjoy for a lifetime. If time and money allowed, I would turn around and do this trip next week. 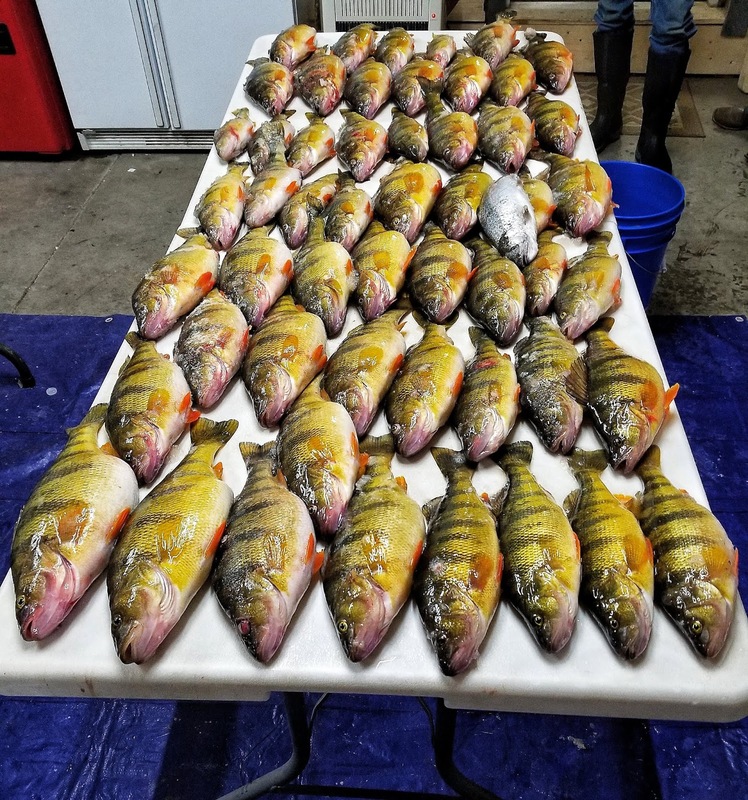 The amount of perch surprised us, the size was just as advertised. Wile talking to many other anglers at the lodge and on the lake, our group definitely had the bite down. We were catching far many more perch than others out in the same areas of the lake. I guess these "5 Iowa Guys" were able to make this bucket list trip, and catch our fair share and then some! "The Captain" Mike Lenius with a big one!